I've been busy since getting my apartment keys about four weeks ago. Some people have made requests on me for "after you're settled in," and the fact is that I will probably never be "settled in." One of my complaints about Denmark was that everything seemed to take longer, cost more money, and require more work, than it should. Being back in Canada has helped a little with that, but I still face a lot of unanticipated delays. I still don't have the possessions that are supposed to be shipped from Scandinavia and Winnipeg. My friend on the Scandinavian side who's looking after that end of it is finding it way more difficult than we expected to even get shipping companies to talk to him on the phone, and they're raising unexpected objections on points like my wanting it to be delivered to my apartment instead of just to a warehouse somewhere in Southern Ontario for me to pick up with the car I don't have, and the fact that all the boxes are already packed and we don't want them re-packing them, and it'll very likely be January before I can expect to see any of that stuff. I'd been hoping to have it in early to mid-November. Meanwhile, on my end I took longer than I probably should have to get in touch with the Canadian movers who'll be bringing my things from Winnipeg to here, and although I think it's arranged now, they haven't gotten back to me with anything like an expected delivery date. I did warn them I'd be away for the last week of December, so I hope they understand they can't deliver it then. One thing in the shipment from Scandinavia, probably the item I miss most, is my main desktop computer. Without it, I'm doing all my local computing on a dinky little Intel Atom-based netbook computer from 2009, with 1G of RAM. I thought that would be okay for a few weeks, and it would have been, but I'm less thrilled at trying to use it for a few months. So, I've ordered new RAM for the netbook to max it out at 2G, and that should have arrived a few days ago, but hasn't. Maybe it will arrive today. The main problem I'm having is that as Web sites continue to bloat and monetize, my Web browser and especially its ad blocker are overflowing the RAM capacity, so I hope doubling that will help. Web browsing with ad blocking is, sad to say, mission-critical for me. Despite the delays, I have plenty to do. Much of it is in the nature of shopping. I got rid of a lot of my housewares on the Scandinavian side because the shipping cost for them didn't compare well to the cost of replacement; combining that with not yet having the things I am having shipped, I've been faced with getting all new pots and pans and dishes and garbage cans and so on. I'm sleeping on an air mattress on the floor right now, and that was another thing I figured would be okay for a few weeks, but it looks like it will be a few months instead. Then there is all the sourcing and setup for my business. I don't want to buy too much for that right now because I don't have the company registered yet (another step which is taking longer than I expected...) and I'm not sure yet exactly how reimbursing myself for purchases made before the company existed, will work. But I have to weigh it against stuff like manufacturing lead times. On some items, the suppliers need so much time between when I place the order and when I get the goods, that I can't afford to delay buying these items or they'll hold up my entire pipeline. And meanwhile I have a whole lot of writing to do - business plan, user manuals, construction manuals, ad copy, store policy, and so on. Then there's all the computer configuration - domain registrations, storefront hosting, multimedia hosting, payment processor, shipping system, (financial) bookkeeping, inventory control, and so on. If I end up buying another physical computer (a certainty, eventually, but I was hoping to put it off another half-year or so) I'll have to set that up, and I'll quite possibly also end up establishing another virtual instance somewhere beyond the one I already use as the backend or home base for the netbook. Rogers Cable still hasn't sent me my first bill yet. I was expecting them to, and I can't log into their online billing system without the identifying information from a paper bill, so I hope they don't think they have sent me a bill and disconnect me for not paying it or something. I bought a whole bunch of IKEA furniture and was surprised by how much work - at least three days - I had to do to get it all set up. I also got shelving and shipping supplies and industrial stuff from other places by online mail order. This is one great thing about living in The Future: you really can just go on the Net and say "Yes I would like the following list of all the things needed to set up a small factory shipped to this address, here is my credit card number, thank you bye," and they'll just do that. I can't imagine this project being viable twenty years ago. You can see on Twitter the current front panel mockups for my first three products. The current edition of my business plan conservatively estimates having the MSK 008 and MSK 010, the two smaller ones, on sale starting in March 2017, and the MSK 007 in July. But I'd really like to beat that timeline if I can. The MSK 007 is my "flagship" product, the one I expect to be most popular and to make the most money, so I want to start selling it soon, but there are issues with getting the right parts for it. I think I may end up going live on the Web storefront with just the other two products at first. One big issue is the knobs - I want the big ones and the little ones to be the same grey colour and that's not trivial to accomplish because the standard grey colours for these knobs don't match and so at least one of the two types needs to be custom-manufactured to get them all the same colour. Just Monday, after a bit of back and forth, I contracted with the Yueqing Daier Company ("my homies in Shenzhen") for a thousand knobs, which will be enough to make more than $100 thousand worth of modules. Uncertainty over whether it would be possible to get the exact knobs I wanted at all, or how long it would take, was one thing holding up the MSK 007 schedule; but now with that out of the way I still have to deal with the three-month order lead time on the potentiometers, which are the electronic parts that sit behind the panel and sense the position of the knobs. Other makers of synth modules have often commented that the front panel and things related to it, like knobs and potentiometers, are the most difficult and expensive parts of the product; and I'm certainly finding that to be true. I have prototype quantities of the front panels for the MSK 007 and MSK 010 on order right now, delivery expected in a few days. (Not the '008 - I've already prototyped its front panel design, and I figure production quantities for it can wait.) I can't really use these panels until I've bought a bunch of parts and received some of my tools from Winnipeg, which probably won't all be accomplished until January, but I wanted to order at least a few panels now, both to take advantage of a time-limited discount and so that I can review whether they'll be acceptable and deal with it if they're not. The panels will be coming from a supplier I've used before, but manufactured with a process I haven't. These front panels are milled out of heavy aluminum with colour printing, and they're very expensive, but I think that's the way I want to do it nonetheless. My customers are very interested in what they call "build quality," and they judge it by sadly superficial metrics. 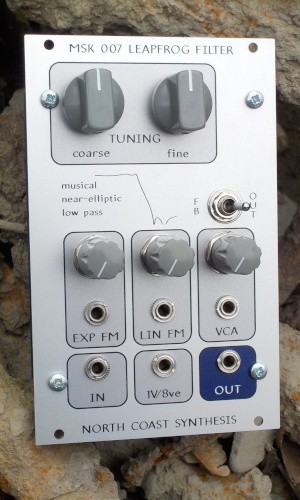 Having the really good front panels, and the really good smooth-feeling potentiometers even though they take a long time to order, will help me justify the margin I charge on other parts of the product, which in turn I need to do to cover development costs and make my overall business viable. If someone has one of my modules in their synthesizer, I want other hobbyists to look at it and say, "Wow! What does that one do?" And be equally impressed when they play with it and listen to it, too.